Ultra HD and Ultra High Definition Video (UHDV) - Ultra-high definition television includes two 4K UHDTV (2160p) and 8K UHDTV (4320p) digital standards offered by NHK Science & Technical Research Laboratories and adopted by the International Union telecommunications. 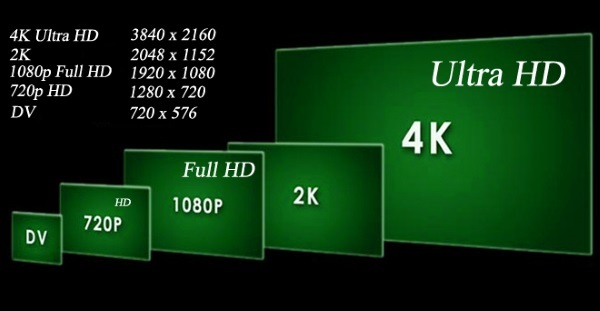 Ultra High Definition, or UHD - this is the next stage of Full HD (display resolution of 1920 x 1080). UHD increases the resolution to 3840 x 2160. 4K are panels with a resolution of 4096 x 2160 and a 1.9: 1 aspect ratio, and UHD panels with a resolution of 3840 x 2160 but, nevertheless, almost every TV or monitor with UHD resolution is advertised as 4K . In the future, UHDTV will be broadcast according to the ITU-R Recommendation BT.2020 standard (or simply Rec. 2020). Old Full HD is called Rec. 709.